What is West Vancouver Citizens for Good Government? WVCGG is a non-profit, non-partisan and non-issue community group whose mission is twofold – to inform, empower and involve residents of West Vancouver to participate in the civic electoral process; and to encourage and support qualified individuals to run for civic office. 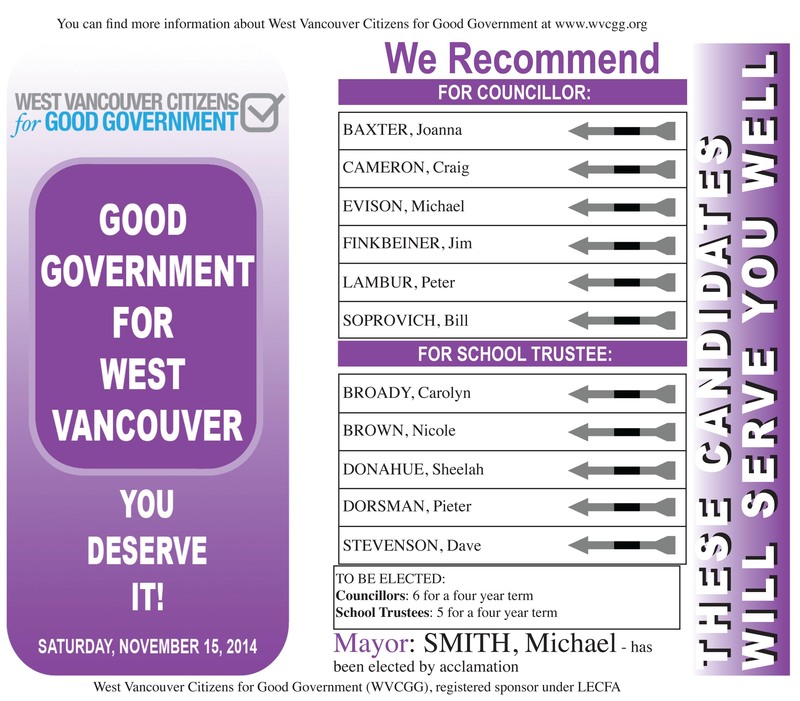 Who are the members of the West Vancouver Citizens for Good Government? Membership is open to any resident of West Vancouver eligible to vote in civic elections by simply completing an application and submitting the required fee. Your participation is sought and welcomed. Please join and support good governance in West Vancouver. To vote at the Endorsation Meeting, one must be a member seven days prior to the Endorsation meeting and be present to vote. Voting by proxy is not permitted. Fees are used to cover costs of meetings and endorsation announcements. Financial reports are provided at the Regular General Meeting, as well it may be posted to the website under the category of Reports. To join the WVCGG, just download the form to the right (click on the image and it will open a pdf). Fill out the form and bring it and the associated payment (by cheque or cash) to the All Candidates or the Annual General Meeting (whichever occurs next), or mail it with payment to PO Box 93043, West Vancouver, V7W 3G4. It is that simple. Then get involved and learn all that you can about the next election. The Board of Directors is elected every three years at the General Meeting (the time and date will be posted on this website). Any member is eligible to run for a position on the board. The WVCGG is required to have 15 board members by its constitution. Every three years, in advance of the Civic Elections, the West Vancouver Citizens for Good Government hold a Regular General Meeting. The date and time for the RGM will be posted to the website (If you would like to be notified in advance of the RGM, please click the Follow WVCGG via Email on the sidebar to the right). At the RGM the members present vote to elect 15 directors from the list of nominated members. All standing members must step down to stand for re-election. Additionally, if the number of directors drops below 15, the BoD has the power to appoint directors to fill the vacancies and ensure the board has 15 directors. How does a member get nominated to stand for the Board of Directors? The BoD selects 2 directors and 2 members at large to constitute the nominations committee at least one month prior to the Regular General Meeting. The nominations committee then creates a list of qualified nominees that are presented to the directors who may approve or amend the list. Additionally, any 5 members in good standing may nominate another qualified member to stand as a director so long as they get consent from that member. The nomination form with consent of the member being nominated must be delivered to the secretary of the WVCGG 21 days before the Regular General Meeting. How do you determine who to endorse? At the Endorsation Meeting, all members PRESENT who are members in good standing at least 7 days before the Endorsation Meeting are eligible to vote for the candidates for endorsement. This is done by ballot. Those candidates receiving the highest votes are endorsed by WVCGG. This nformation is published in the newspaper, on this website and mailed out in our brochure. Prior to the vote, the Board of Director’s recommendations for endorsement will be presented. The membership is free to vote as they see fit. Does the Board of Directors explain to the membership why it recommends specific candidates for endorsation? The Board of Directors attends the All Candidates Meeting, the Endorsation Meeting and interviews the candidates. The process is an intense one and involves an evaluation by each board member on a list of selection criteria. Because each board member is evaluating each of the candidates independently and weighting different criteria based upon his or her values, it would be difficult to properly sum up the reasons for recommendation for each candidate fairly and it would not necessarily be very helpful as the values of each of the members vary as much as the directors. The directors were selected by the membership to reflect the community as a whole while agreeing to immerse themselves in the intense interview process. The directors use a selection criteria that has been developed over years by members of WVCGG. They are passionate about the municipality as well as many are past members of council, the school board and numerous community organizations. WVCGG extends a thank you to all past and current members who have helped make the process rich and valuable. What Criteria does the Board of Directors use in selecting the candidates that it recommends to the members? Why do you charge candidates money for endorsement? The money charged to candidates for endorsement goes towards the cost of mail out brochure. The amount of money charged to candidates does not entirely cover the mail out of the brochure and some membership fees are used to pay the difference. A lot of thought has gone into this process and the solution of charging the candidates for the endorsement has shown itself to be the least problematic and most favorable. The other two options would be to raise the money through donations (or advertising) or to charge more for membership. Neither of these options is ideal. By raising money through donations or advertising the possibility of undue influence could be construed if a large portion of the money being raised or advertising being purchase was by interest groups. Over time this could damage the community based commitment of the organization. Additionally, significantly larger membership fees may become an obstacle to many concerned citizens participating in this process and thus also damage the community based commitment of the organization. WVCGG is committed to the full participation of both the public and qualified candidates in the election process and is sensitive to the financial pressures of the economy. To prevent finances from impacting the democratic process, WVCGG will make arrangements for any member or candidate who can show financial hardship yet still wants to participate in the process. Why doesn’t the WVCGG post the questions that it asks candidates to the website? Although the WVCGG has now asked the candidates to respond to some questions on the website, there are several concerns with using the website as a forum for questions and answers for the candidates. The largest concern is that candidates that answer questions later than others will have the ability to create better answers that take into account all of the issues brought up until that point. This could create the feeling of an online debate, but the candidates who answered first wouldn’t get the opportunity for a rebuttal. This wouldn’t be a fair process. The other concern is that any list posted to the website would not be exhaustive, as follow up questions may arise during the interview process. As well, questions that would be appropriate to one candidate based upon his or her skills may not be appropriate to others. All questions asked of potential candidates during the interview process are completely within the scope of the criteria listed above and should be anticipated by any qualified candidate running for office. How long before the election do I need to be a member of WVCGG to vote at the endorsement meeting? Only members who are in good standing not less than 7 days prior to the endorsement meeting shall be eligible to attend and vote. Typically the WVCGG have endeavoured to schedule the All Candidates Meeting at a time at least 7 days prior to Endorsement Meeting so as to make it easy for people to acquire their membership while participating in the democratic process. For all dates see the home page of the WVCGG website and make sure to get your membership in on time. With three levels of government (municipal, provincial and federal), it can be a chore for an individual to keep fully informed for each one of the elections. Many people have to deal with strata councils and board meetings, families and jobs, children’s school events and extra- curricular activities, volunteer work and other demands on time, all of which can make it is difficult to apply the level of scrutiny that ensures that the best qualified candidates are given the opportunity to serve their community. For example, even when one is fully informed on candidates for Council and Mayor, it may be a little more difficult for some citizens to assess the qualities of individuals running for School Board positions. WVCGG is a community organization that seeks to keep its members and the public informed in the upcoming election by providing an All Candidates meeting. All qualified voters can be members of the WVCGG and are encouraged to do so (please download the application form and sign up). With a broad cross section of the West Vancouver voting public joining WVCGG, the organization can share the knowledge and the diverse concerns of the community. WVCGG supports the belief that West Vancouver remains a community where individuals can stand for elected office without conforming to the specific objectives of a particular interest group, partisan slate or party. It is the qualities of the candidate (abilities, skills, community involvement, etc.) that members evaluate and support. WVCGG also understands the need for candidates to have the skills to be effective as part of an organization whether on Council or the School Board. The interview process is designed to not only bring out the strengths and weaknesses of individual candidates but to assist the directors in recommending a Council and School Board that can work together and still remain sensitive to diverse interests within the community. When voting, the public needs to know more than how a candidate feels about a few issues. A successful candidate will have to deal not only with a wide range of items within the 3 year term, but also be responsible for decisions that affect the long term wellbeing of the community. The goal of WVCGG is to assist in the process of selecting worthy candidates for local government. How do I find out more about the current election? All of the current election information is available on the Municipal website. As well, we will post information to the WVCGG home page on this website. When and where are your candidates meetings? We will post the schedule of our All Candidates meetings as well as any others that we are aware of, along with the Endorsation Meeting to the WVCGG home page on this website. How many people sit on council? There is one mayor and six councillors for the District of West Vancouver. How many people sit on School Board? *School District #45 (West Vancouver) includes the District of West Vancouver, the Village of Lions Bay, Bowen Island Municipality, and part of GVRD Electoral Area A. How do I find out more about West Vancouver municipal politics? You can find West Vancouver Municipal Election information on there website (here). As well, you can find information about the Municipality of West Vancouver at wikipedia (here).